could also probably waddle about on land, but the weight of the large skull and heavy ribcage of Ichthyoste-ga probably meant that it had to rest its belly and head on the ground from time to time. Acanthostega and Ichthyostega were found in sediments deposited by meandering rivers that flowed through forests of lycopods and low-growing ferns. The climate was monsoonal. Coates (1996) argues that Acanthostega lived most of the time in stagnant, vegetation-choked backwaters, emerging in damp conditions, but staying underwater in the dry season and gulping air at the surface. It walked largely underwater, stepping over vegetation, and kicking itself along the bottom. 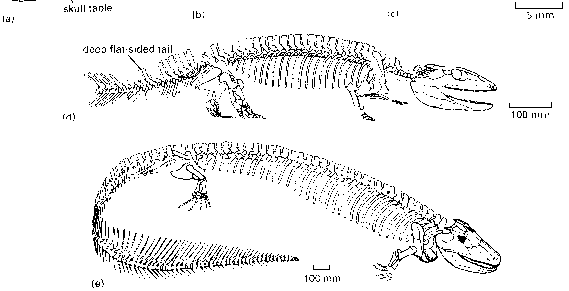 If this is true, it suggests a rather unexpected change in the 'standard' view of why tetrapods grew limbs. Instead of simply stepping out of the water and trotting about on the land, the first tetrapods were still perhaps largely aquatic. Coates and Clack (1995) argue that Acanthostega and Ichthyostega lived in fresh waters, and that Tulerpeton lived in the sea. The broad ribs of Ichthyostega could have served as a partial support for the internal organs when it ventured on to land, whereas the forelimbs acted as props and the hindlimbs as paddles, rather like a seal. Acanthostega and Ichthyostega had functioning gills, even as adults (Coates and Clack, 1991). Perhaps fully terrestrial tetrapods emerged only 25 Myr later.